Some of you know our son, Greg Herbert from his years at St. Rita School or while attending Redwood High with him. Maybe you know Greg from watching him frustrate opposing players on a soccer field or by hanging out with Greg and other mutual friends. He is 19 now, a wonderful son, brother and good friend to many. Greg is an amazing young man with an excellent sense of humor, who has always seemed wise for his years. 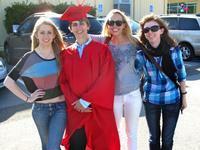 He has graduated from high school and is now facing an uncertain future due to his declining health. Although he never talks about it, Greg’s early wisdom comes from experiencing life’s ultimate challenge from his very first day. As you may know, Greg was born with a rare liver disease known as biliary atresia. This is a congenital liver defect that used to be 100% fatal in the first year to all babies born with it. For the past 19 years, Greg’s doctors have been able to control the disease. Unfortunately, Greg’s liver is now failing and his doctors at the University of Colorado Hospital have told us that his only option now is a life-saving liver transplant. Not only is this transplant a major surgical procedure for Greg but it is also very expensive and his insurance will not cover all the costs. Some of the out of pocket expenses are co-pays, deductibles, travel and relocation to the transplant center and a life-time of anti-rejection medications. For those who are able and would like to contribute, a fundraising campaign in Greg’s honor has been established with HelpHOPELive (formerly NTAF), a nonprofit organization that has been assisting the transplant community for nearly 30 years. All donations are tax deductible, are held by HelpHOPELive in the Midwest/West Liver Transplant Fund, and are administered by HelpHOPELive for transplant-related expenses only. If you wish to help Greg, please see the options below:Your support is crucial! A fundraising committee has been formed and is open to any ideas or help you can give is welcome! On behalf of Greg and our family, we thank you for your support.